I used to think life was too short to stuff a toy – or was that a mushroom? – but I’ve been persuaded to change my mind. 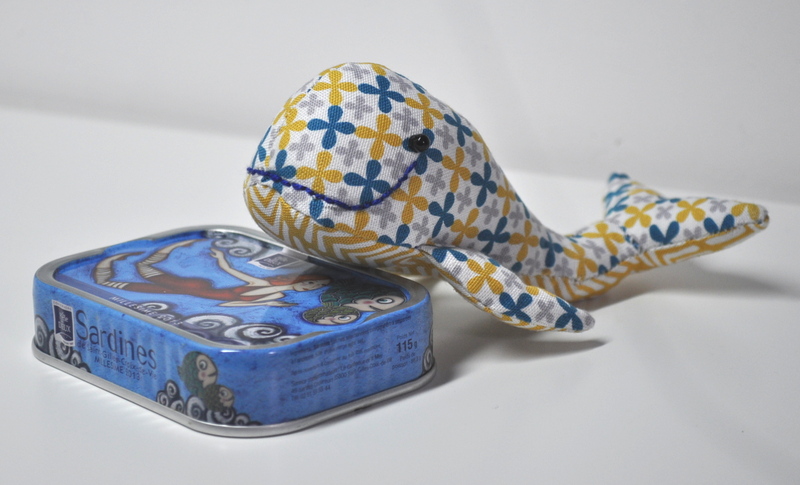 Anyway, I made him from scraps of some lovely canvassy fabric in seaside colours and put into use the tin of sardines I bought just because I love the illustration on the tin. I can’t stand sardines. 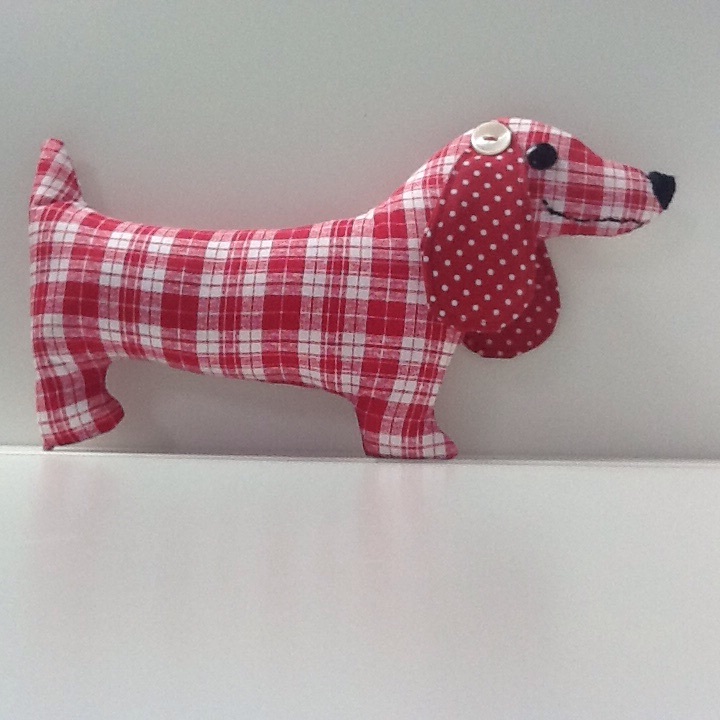 This is another of Jodie’s patterns which I thought I might be able to do something with to decorate my stand at the Christmas Fair in November to raise funds for the Twilight Retirement Home for Dogs. 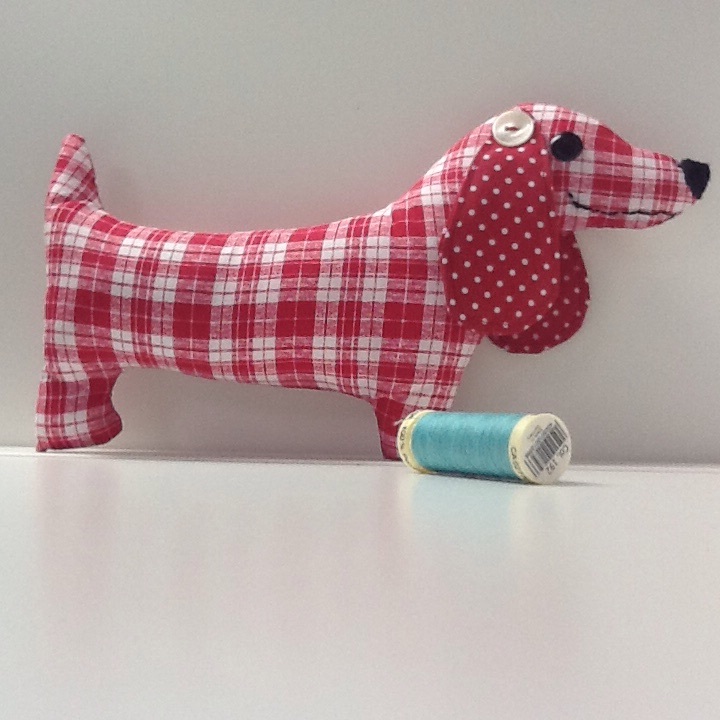 Nothing wrong with my pattern cutting or stuffing skills here – he’s just cocking his back leg for a wee 😉 Honest! The dogs aren’t free-standing so I’m wondering about making a garland to hang in front of the stall – or over it even if I can figure out a good way to do that. Anybody made a garland with ‘softies’ before? Tips and hints would be appreciated and possibly followed slavishly. Non-matching cotton reel for size purposes. He’s quite dinky. I don’t know what this particular pose is called but they all look so elegant. 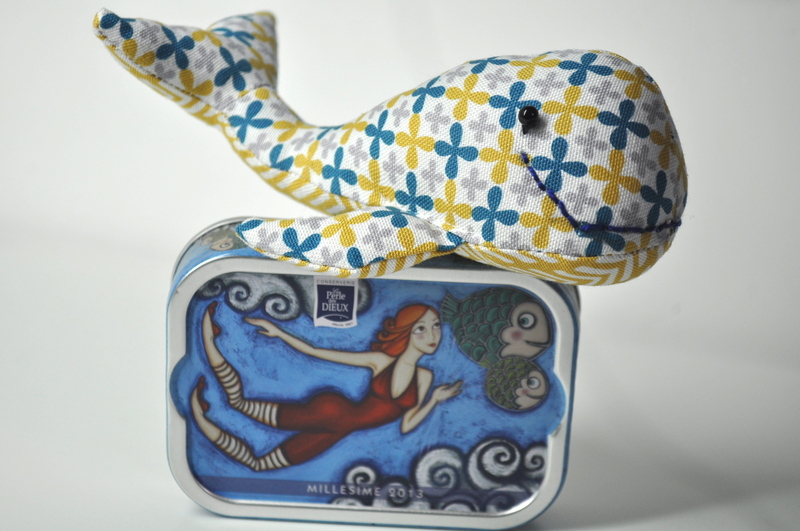 I couldn’t resist another whale photo and a better look at the sardine tin. 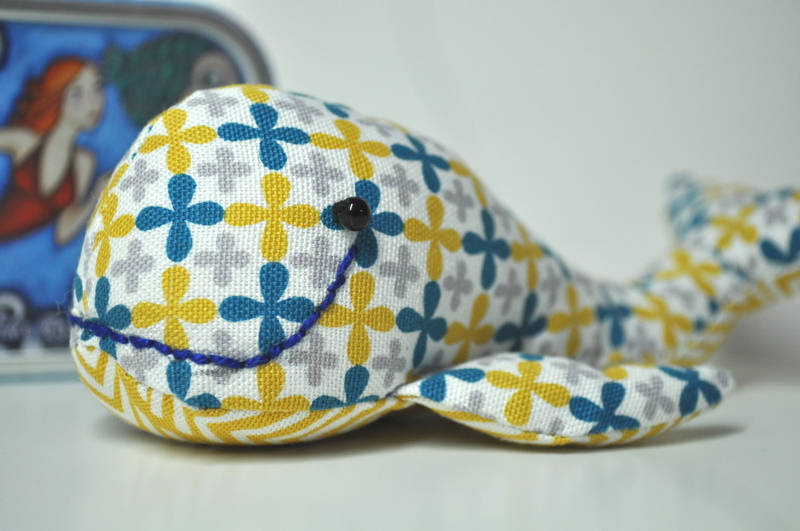 I might even use that design for a future freehand embroidery project. 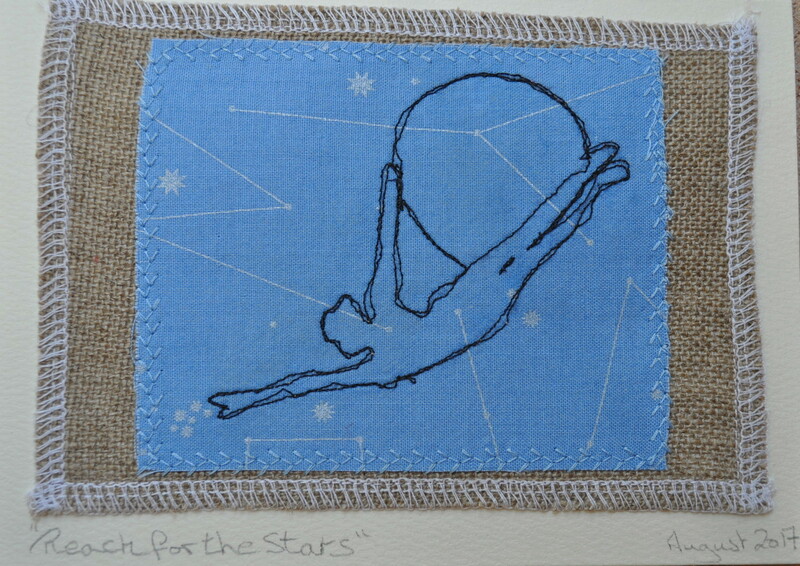 All made with scraps so I’m joining in with Kate’s Scraphappy Day here where you can click to see what the other participants have been doing with their scraps this month – see I told you there was ‘reasoning’ involved. I have been spending quality time with visitors (this was a scheduled post) and being a visitor myself over the next couple of weeks so don’t worry if you don’t see me around as much as usual – I haven’t disappeared under a pile of unlaundered dog blankets and left to suffocate. Although if I’m not back after a couple of weeks feel free to check.